July | 2012 | Get Glenn Mobile! One thing that’s been a recurring annoyance over the past couple of years has been the lack of a good knife around the house. 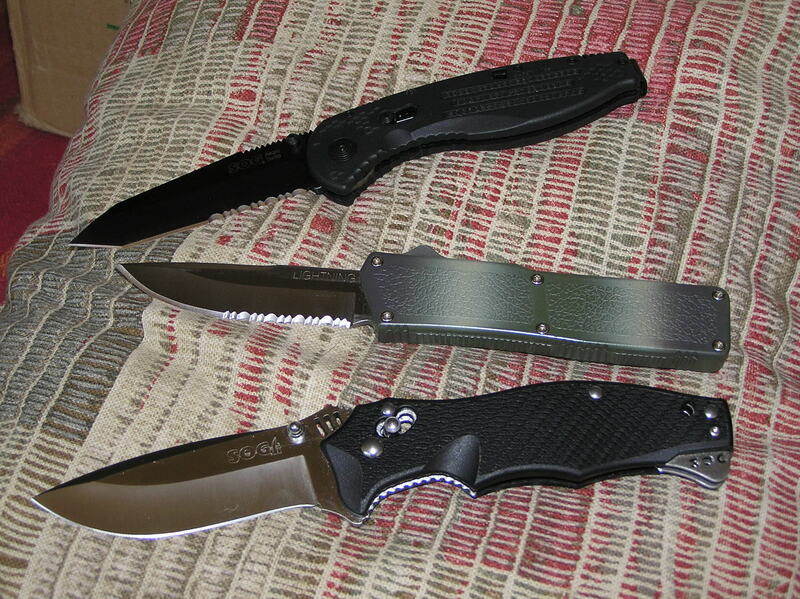 I used to have a nice Benchmade Elishewitz Stryker but it magically disappeared while we had some people ‘helping’ us declutter the garage. Benchmades aren’t cheap. That Stryker cost upwards of $150 back in 2000 and on my limited disability income I can’t just throw that kind of money at any one item. Ah, but the world has come a long ways since then. Benchmades are still justifiably pricy, but you can do well if you’re a careful shopper and don’t have to have fancy carbon fiber G-10 handles and titanium liners. 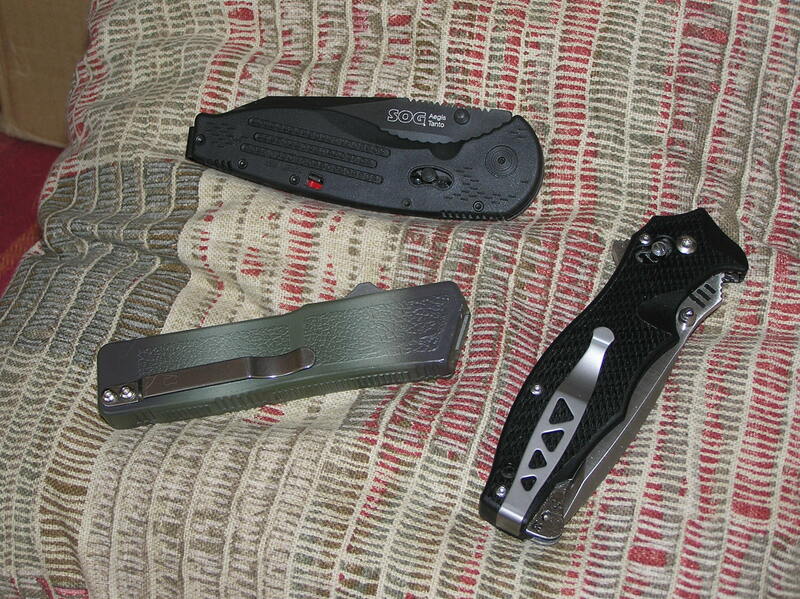 A bit of shopping and cross referencing turned these three up that have been added to my toolbox, a SOG Aegis AE-04 tanto point knife, spring assist opening and very lightweight…it uses no liners at all! It’s clipped to my shoulder bag and should be able to cover any light to medium duty tasks. $60 shipped from Amazon and I had a knife as good or better in most ways than my departed Benchmade. I also wanted a more solid heavy duty piece with a more utilitarian blade, and the SOG Vulcan VL-01 fit the bill nicely. With a Japanese supersteel san mai blade, steel liners, and a steel arc lock tested to 1000 pounds of pressure, it’s smooth as silk and needs no spring assist. With an MSRP of $184 and a normal selling price of over $100, I thought I’d be waiting on the acquisition of one of these for a while…until I noticed one of those eBay consignment sellers offering one from an estate that I sniped for a mere $61. Last was a pure fun indulgence. A video in my YouTube subscriptions showed up recently from user ‘nutnfancy’ where he’s absolutely raving about the Taiwanese Lightning OTF (out the front) automatic knife. Not only did he compare it favorably to auto knives in the $200-$300 range, he demonstrated various cutting tasks and flawless deployment and stowage of the blade. I’m glad I ordered two; my mom saw mine and grabbed it covetously right away. Yeah, it’s technically a switchblade but when you have limited and/or weak hand use, a knife that can be opened and closed with the slide of the ramped control lever’s a huge benefit. There was a nice side effect to all this, I’m rediscovering that horse trading and handling weapons is a mighty empowering thing! Does that mean I’m looking for some conflict to have an excuse to stick somebody with one of these? Don’t be ridiculous. Like firearms, I hope I never have to use any tool I own in self defense…doubly so with bladed weapons and me in a power wheelchair. It’s just a good feeling being able to have more tools at hand when I need them. One other benefit to these Lightning auto knives…right now they’re dirt cheap (when not sold out) at only $30 apiece. I’ve spent my fun money for the month, but I plan in to lay in a pile of these in the near future, after allowing some budget in August if my friends can get me to Tampa…you bet I’m still keen to get there if I can! From a prepping standpoint these could be worth their weight in platinum in a SHTF situation with those who didn’t bother to lay in supplies suddenly finding themselves with an urgent need for a tool or weapon like these. Besides, nutnfancy’s right…they are a blast to just play with! Back in the world, the Indiegogo campaign continues and will continue until its goal is met. I know that first campaign’s deadline was a tactical error since so many people seem to assume I’d simply abandon the project after the first try didn’t succeed. The idea that I’d give up, with over $10,000 now raised, all those great endorsement videos from my friends helping raise awareness and backup for the project, and my life ahead of me once I get free is crazy! Let there be no mistake: I’M IN THIS UNTIL IT SUCCEEDS…I’M CONTINUING THIS FUNDRAISER UNTIL IT’S DONE! Yesterday saw the publication of my latest article for the American Daily Herald, Antonio Buehler Wants Peaceful Streets For Everyone. I’ve been drawn to this story from the first moment I encountered it, since I’ve never seen such a perfect example of arbitrary and capricious use of State power to indimidate anyone who questions it with whatever threat they deem necessary to crush that inquisitive spirit. From maintaining an aggressive demeanor to assault, kidnapping, and even murder, Americans have over time accepted this behavior as a legitimate expression of the State’s presumed monopoly on force, not only from a traditionally moral standpoint of defense to the historically immoral practice of initiating force against individuals for any reason that takes its fancy. This piece took a deal of effort to write accurately, watching relative videos many times in order to get the timeline as precisely correct as possible. It was well worth it, and because this is such a superb cautionary example of what’s become a systemic practice in America, leaving nothing but destruction in its wake, I hope we can develop techniques to effectively counter this awful habit of casually destroying peoples’ lives. Antonio Buehler’s facing the possibility of years in prison for having the audacity to question the actions of a couple of official Praetorians he came across at play, but at this point I can’t see any jury actually convicting him of the clearly bogus charge of felony harassment he was tagged with. The evidence refutes the official story, their actions to indimidate witnesses after the fact are obvious, and the subsequent internal affairs investigation was such a baldly transparent whitewash to cover the police officers’ unlawful behavior that I’m sure Antonio won’t see a day of jail. That he’ll be free to continue his life and keep building and promoting his Peaceful Streets Project is wonderful, and I hope it succeeds even beyond his wildest dreams. At the risk of repeating myself, I’m still in prison here at home, for committing no crime other than becoming more disabled than anyone else has felt worthy or been capable of helping me escape. Like Antonio, I too have plans and aspirations, but they remain on hold and my life in limbo so long as that imprisonment goes on. Once I do get out, I’m hopeful that projects like Antonio’s will help remove the threat of arbitrary targeting by officials as I go about my business…but first I actually need to get out. The Get Glenn Mobile! project has come a long way in the almost one year it’s been in existence, with over $9000 raised during its first phase, and close to $600 pledged to the current Indiegogo campaign. I obviously erred in using the fixed funding option in the first one, since the near $5000 pledged in donations were returned to donors when the goal wasn’t met, and far worse, many people seem to have gotten the impression that I’d simply give up at that point and have not re-donated their first pledges. Nothing could be further from the truth. I am very much alive, aware, and frantic to see the restoration of my freedom. Again, I’m sorry if anyone got a different impression…there will be no more deadlines, and this, what I fervently hope will be the last phase of the fundraiser, will run until it’s done. One last note: though the passing of the July 11 deadline means I won’t be able to get to Tampa independently, in no way am I giving up on the goal of getting there somehow. I have friends seeking solutions like donated or severely discounted rental of a wheelchair accessible vehicle, but that’s why I left some wiggle room financially with the current campaign. I really want to go, and I desperately need my freedom back. Please take a moment to make even a small donation to my Indiegogo campaign to make these happen! I’m beginning to think I made a bad decision with the fixed funding Indiegogo campaign that passed its deadline on the 11th. All pledges were refunded, and I’ve asked that those people re-donate to the current campaign, which has no deadline and use flexible funding…I retain all donations even if the goal isn’t met. My error was in thinking that the deadline would result in either of two extremes: the goal being met in a few days, or that little would be donated. As it turned out, over $4600 was pledged…all of which has now been returned to the donors. The deadline’s purpose was to stress the time limit if I were to make it to Tampa to participate in the events surrounding the RNC independently, pure and simple. If I can’t do it under my own power I’m open to alternative means, but I am in no way abandoning this project! That’s why I stayed up that night to get the new flexible funding campaign set up, launching it shortly after the deadline for the first one passed. I realize it’s an annoyance asking the original donors to re-donate. Rest assured, there will be no further deadlines, I’ll be retaining all funds, and the donors’ perks can be awarded, whereas with the first they aren’t awarded when no one’s actually donated since their funds were returned. Live and learn. My apologies for any confusion, but Get Glenn Mobile! is alive and well, and this Indiegogo campaignwill simply run until the goal’s met, allowing me to modify my Honda Element for wheelchair access to release me from the three years’ housebound confinement I’ve been under. I tried to get reminder/thank you messages to some of the original donors, but Indiegogo isn’t letting me. I thank all who’ve gotten involved, but now we need to get back up to speed; had I retained that $4600 plus, I’d now be halfway home! Those dratted unforeseen consequences will bite you whenever they get a chance! There’s just about 2.5 days left for the current Indiegogo campaign, and while I’m encouraged and gratified that many have pledged a donation to it, the fact is that we’re still at just under a quarter of the goal of $21,000. Barring the sudden completion of the goal by someone wanting to secure my house and all my property for their grandkids by becoming the named heir in my will and bequeathing them to that person or the organization of their choice, we’re not likely to see the deadline met. Fair enough, I set the campaign up with a deadline to make it clear that past this I really won’t have the time to get my Honda modified, returned to me, and get myself to Tampa in time for the RNC and the events surrounding it in August. Making Tampa is a dream of mine…but it’s only one dream of many. If the deadline passes unmet, I won’t be moping around, I’ll begin another Indiegogo campaign, this time without that short term deadline. If I don’t succeed in the marketplace of ideas with my wish to speed things up to make the deadline for Tampa, them’s the breaks. Still, donations have been pledged, and the $3700+ accrued so far tells me that there are enough interested donors to make this happen, just not as fast as I’d have liked. The biggest negative in starting a subsequent Indiegogo campaign is that all of those current donations will be refunded and I’ll have to ask anyone who’s still interested in seeing me succeed to re-donate once the new campaign’s running. My apologies for the hassle; I thought the deadline was a worthy try. The surprising but happy late additions of Tom Woods’ and Adam Kokesh’ videos aren’t going anywhere, so with theirs along with the other great endorsement videos I’ve seen from my allies such as Tatiana Moroz and many others, I’ve got all the tools a person could ask for to help back me up and reinforce the validity of my Get Glenn Mobile! project for new visitors and potential donors. I hope all of you will be of good cheer here, it’s clearer than ever that we will succeed, if not in the next couple of days then at some point soon. Don’t forget, until the goal’s met I’m still a housebound prisoner, still run the risk of injurious or fatal fall when I have to drive to a doctor’s appointment thanks to my near-inability to transfer, and of course I still want to get out in public to help educate, promote and write on the benefits of liberty for us all. Over $9000 from the project’s early phase is in hand, only the current pledges will be refunded. I’m not going anywhere until I can drive myself out of this! Holy Big Damn Endorsement Video, Batman! I was delighted today to see that Adam Kokesh of ‘Adam Vs. The Man’ went to the trouble of producing a five minute endorsement video for me today. How cool is that? My list of endorsement vids is looking like the Who’s Who? of the liberty movement, from Adam to Dr. Tom Woods, Tatiana Moroz, Nick Allison, Adam House, Jordan Page, Jason Rink…whew! This time limited Indiegogo campaign just got a serious shot in the arm, and if people keep pitching those small donations in large enough numbers, it WILL succeed. Thank you, Adam…can’t wait to hit the road to Tampa!